Colorado's Donations Coordination Team and Volunteer Coordination Team were awarded the FedEX Innovative Program Award at the National VOAD Conference on May 15, 2012 in Norfolk, VA. 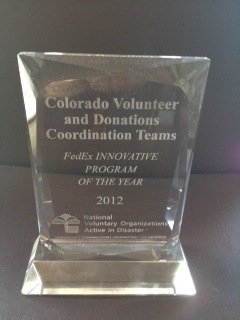 This award was issued to the team for work on the Colorado Donations and Volunteer Management Network. The Colorado Donations and Volunteer Management Network is a collection of partners, practical tools and initiatives that aim to provide enhanced services to disaster survivors as they relate to donation management, volunteer coordination and information and referral. Jen Poitras, facilitator for the network, accepted the award on behalf of the team. What is Colorado Voluntary Organizations Active in Disasters? Colorado Voluntary Organizations Active in Disasters (COVOAD) is the Colorado state chapter of National Voluntary Agencies Active in Disasters (NVOAD). It consists of organizations active in disaster response throughout the state of Colorado. COVOAD's role is to bring organizations together, enable them to understand each other and work together in a cohesive manner. To accomplish these goals, COVOAD meets with its member organizations several times each year to share information and training opportunities. These meetings also provide the opportunity to conduct business, plan, network and provide updates on current disaster relief efforts.